ThoughtFarmer is helping this global health and social services development firm mold its far-flung workforce into a cohesive team. 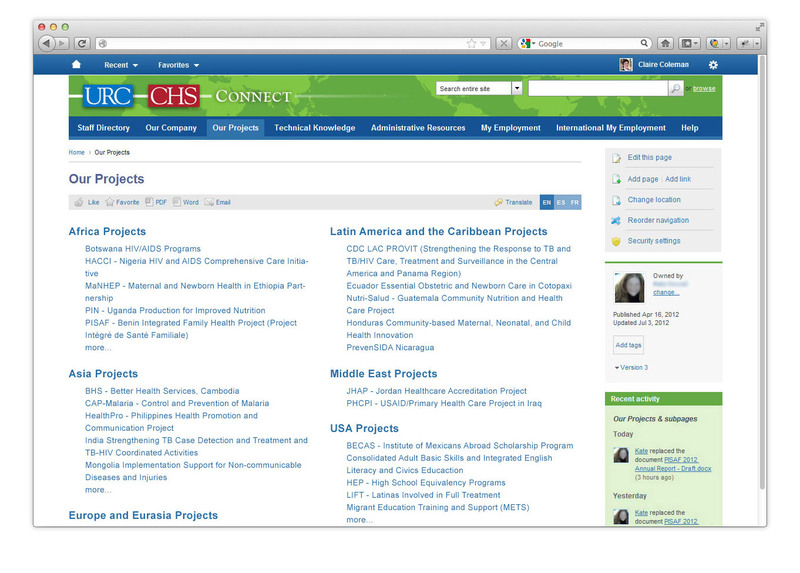 URC-CHS’s resources are in high demand to managing development projects funded by philanthropic and aid organizations, including the Gates Foundation, CDC and USAID. In the last five years alone, the organization has seen four-fold growth, and rapid expansion continues. Explosive growth has come at a cost. With a multilingual workforce of over 800, scattered to every corner of the globe – over 40 countries in all, including some of the least developed – URC-CHS was suffering serious growing pains. Employees complained of not being able to find basic company information they needed to do their jobs. E-mail was still the default online collaboration tool, generating a confusing jumble of redundant and potentially outdated documents that cluttered file and mail servers. Nobody had a good handle on the company’s rich skills base, so resources were chronically under-utilized. There was also little sharing among far-flung project teams. URC-CHS staff were constantly reinventing the wheel. Isolated as they often were by geography and language, employees rarely felt part of a larger, cohesive whole. Those growing pains are now starting to ease and it is thanks in part to ThoughtFarmer. 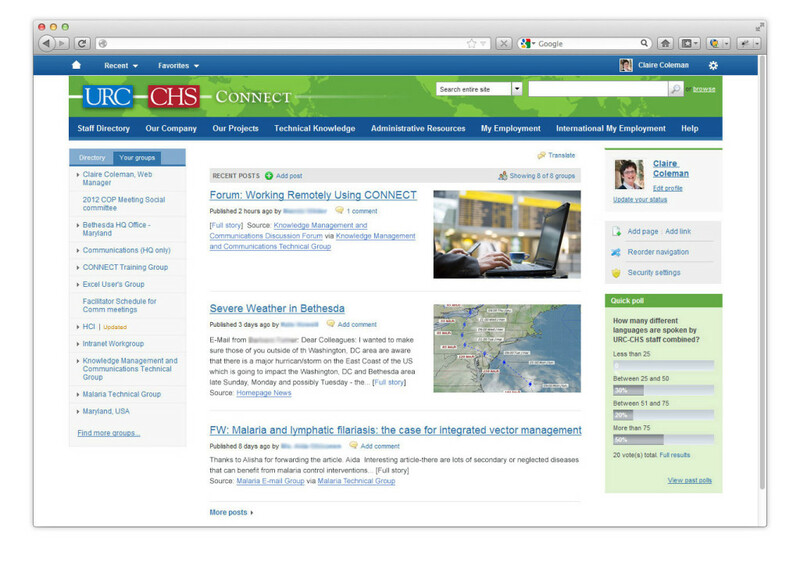 As a key element in a larger communications and knowledge management (KM) initiative driven by senior management, URC-CHS implemented CONNECT, its ThoughtFarmer-based intranet in July 2012. By fall, it was already delivering results. “I’m immensely happy with this platform,” says Elizabeth Ransom, the company’s director of communications and one of the prime movers behind the project. 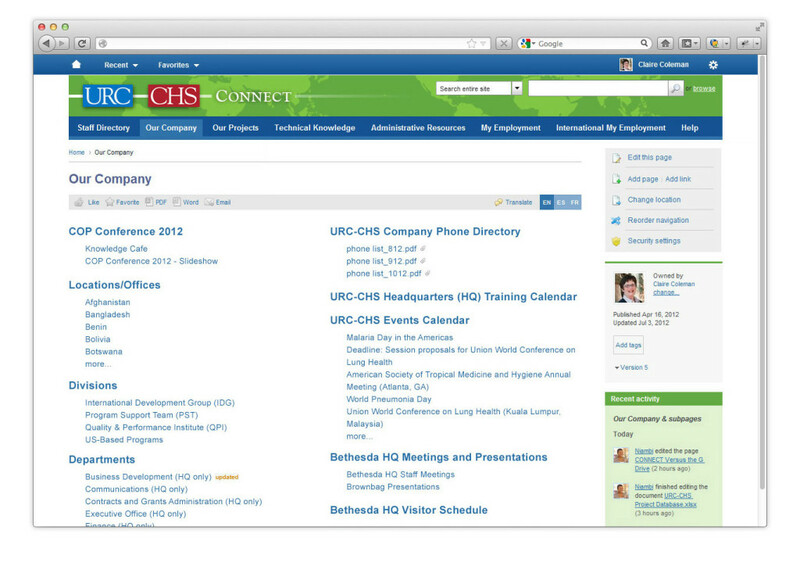 The simplest of the problems – poor access for employees to company forms, guidelines, policies and procedures – was one that URC-CHS’s old intranet, built in-house using a pre-release version of Microsoft SharePoint, should have been able to solve, but couldn’t. It was difficult to navigate and more difficult to update, so little used. It was also largely inaccessible outside the U.S. – where the vast majority of employees now worked. Some documents were stored on other servers, but there were frequently multiple, conflicting versions, and field employees often didn’t know where to find them – or even that they existed. Now everything is in one place and the simple-to-navigate ThoughtFarmer interface makes it easy for everyone to find. The company can even ensure that employees only see information relevant to their country or region. From Malaysia to Mozambique, from Bangladesh to Botswana, this is what URC employees see when they log in to ThoughtFarmer – with slight variations by region, and personalized for each employee. Online collaboration, essential in such a distributed company, was another problem, both for teams confused by multiple versions of documents attached to e-mails – and the IT department that saw its servers choked with duplicate files. With ThoughtFarmer, collaborators edit and update documents online. “That means everybody works on the same documents and just uses one version of each,” says Dr. Erika Stolz, project director for URC-CHS’s CDC-funded TB/HIV management project in Central America. Stolz’s team is already using one of ThoughtFarmer’s intranet collaboration features: the software keeps track of versions so participants always know which is the latest and who made revisions. In business – and humanitarian – terms, the most serious of the problems facing URC-CHS was poor communication and lack of sharing among project teams. This has significant bottom-line implications. “If you can take and use something somebody has done somewhere else you can potentially save yourself weeks or months of work,” says KM specialist Kate Howell, another key intranet champion at URC-CHS. The lack of sharing before ThoughtFarmer was hardly surprising given language barriers and geographic dispersion. As Rokita points out, the company’s rapid growth was only making things worse. New or long-time employees can get a quick snapshot of their company, its impressive breadth and depth, at the Our Company page. The old intranet was never really designed to help – it was mostly a document depository. But ThoughtFarmer is already bridging the geographic and language divides. Its technical working group forums encourage exchanges among specialists with similar interests. Direct access to other teams’ project pages is another rich source of new ideas. ThoughtFarmer includes built-in translation functionality so users can roughly machine-translate pages on the fly, or access professional services online for more critical information. If they want to know what their company is doing and where, URC employees can see at a glance on the Projects page, and drill down for minute detail. A related problem was not knowing what skills might be available within the company. “There was lots of expertise, but it was difficult to tap into,” says Claire Coleman, URC-CHS’s Web and intranet manager. ThoughtFarmer’s hugely popular staff directory is helping solve the problem. It includes pictures and searchable skill profiles for every employee. “So now if you need someone who speaks Russian, and has writing skills and maternal/child health expertise, you can find her,” Howell says. ThoughtFarmer, and the directory in particular, is also helping bring people in the company together in more social ways. With over 800 employees working in more than 40 countries, knowing what the company knows is a major challenge. The Technical Knowledge page on ThoughtFarmer makes it easy for managers and employees to find out. 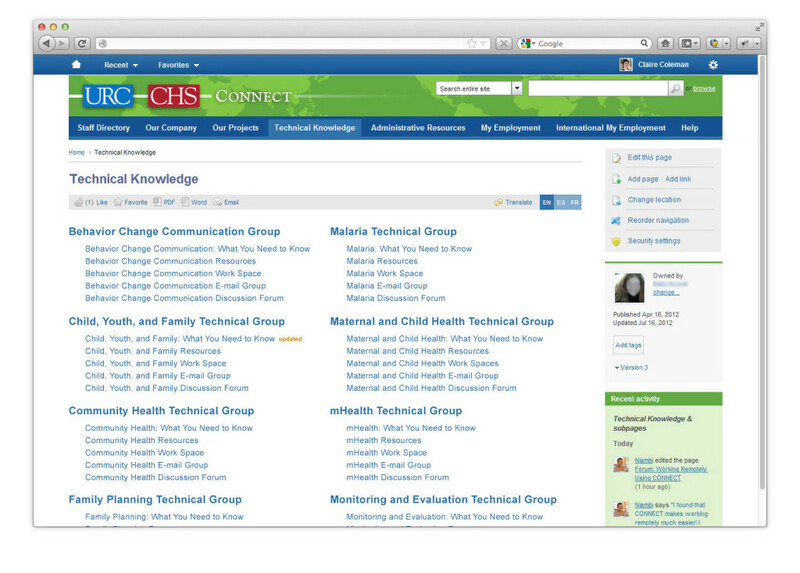 URC-CHS’s intranet team considered Microsoft SharePoint and intranet solutions from several other major vendors. They chose ThoughtFarmer because it delivered more of the company’s key technical and business requirements. Clinchers included ThoughtFarmer’s translation features, its support for extranets – giving clients and partners limited access to specific project areas – and its ability be hosted in the Cloud thus ensureing a good experience for users logging in over low-bandwidth connections. It’s still early to reliably quantify results, but Ransom says the company will eventually do follow-up studies. In the meantime, all indications are extremely positive. Doing good in the world, as URC-CHS understands, takes more than a few good people working on the ground. To ensure the neediest and most marginalized on the planet get the best help money can buy, it takes an efficient, professional organization, making optimal use of its resources. ThoughtFarmer is helping URC-CHS do that.